Typically, new student courses will be added during the VCAT Import process, using your SIS students and teachers assignments. 1. Under the Data tab, select the Year. 3. Click on the + sign at the very bottom of the next column (column with courses). 4. 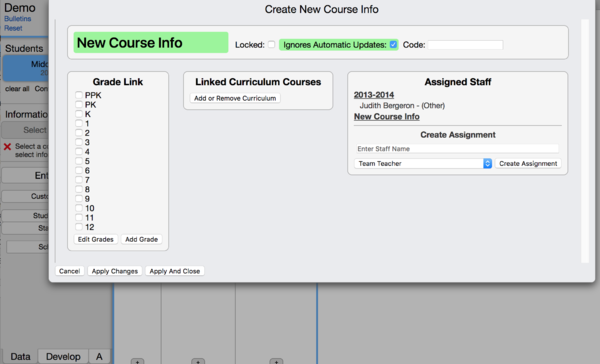 In the Create New Course Info window, click on New Course Info to type in the course name. 5. Link any curriculum courses that will be needed for Data Entry, if any. 6. Assign the teacher and any other staff, if appropriate, by typing their first or last name in the Enter Staff name field under Create Assignment, select them, choose a proper role, and click on Create Assignment. Note: When checked, 'Ignores Automatic Updates' means that the VCAT Importer will ignore this course (and its sections) therefore, the students and teachers assignments will not be updated during the import process. The Edit Course Info dialog is part of the Student Group Editor. To learn more about the Student Group Editor and how to access it, please click here. Typically, new student sections will be added in the VCAT Import process, using your SIS students and teachers assignments. Students and teachers will be assigned as well. 3. 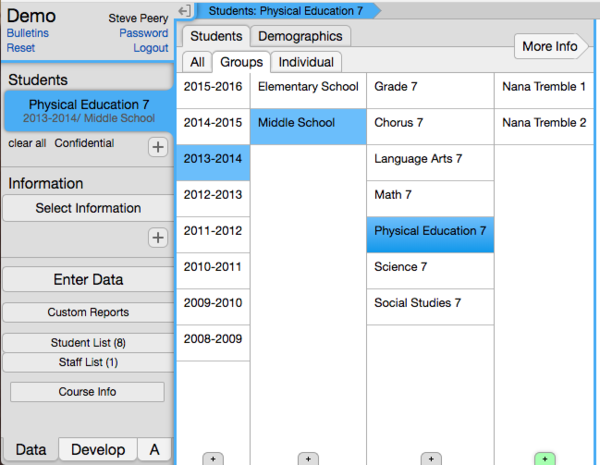 Select the Course you wish to manually add a section to. 4. Click on the + sign at the very bottom of the next column (column with sections). 5. In the Create New Section Info window, click on New Section Info to type in the section name. 6. 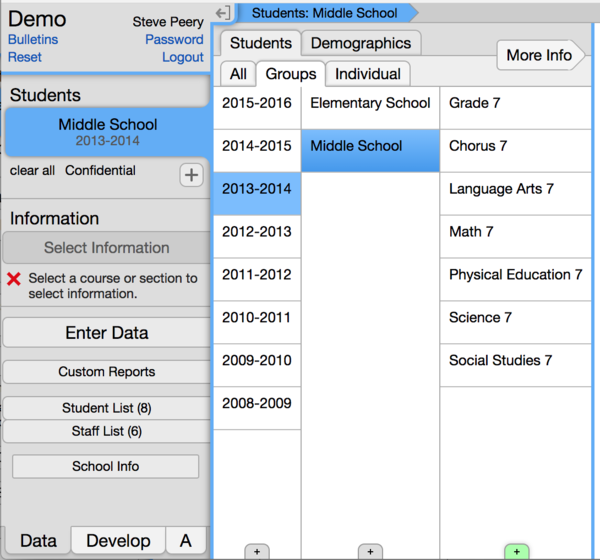 Assign students by typing their first or last name in the Enter Student Name field under Assigned Students, click on the student in the drop-down to select. 7. Assign the teacher and any other staff, if appropriate, by typing their first or last name in the Enter Staff Name field under Create Assignment, select them, choose a proper role, and click on Create Assignment. Note: When checked, 'Ignores Automatic Updates' means that the VCAT Importer will ignore this section therefore, the students and teachers assignments will not be updated during the import process. When the VCAT Import is run to update the students and teachers assignments, it can leave courses and/or sections empty; no student nor staff assigned. 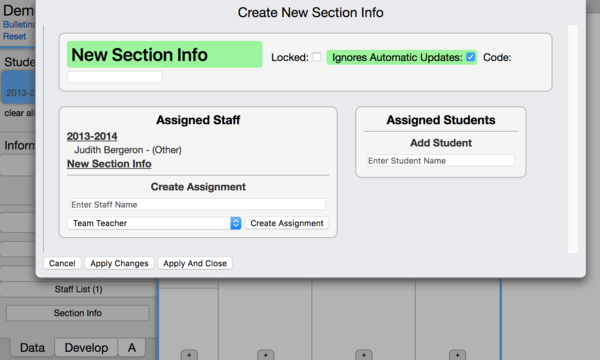 MAKE SURE THE SECTION HAS NO STAFF ASSIGNED AND NO STUDENT ASSIGNED BEFORE DELETING! The Edit Section Info dialog is part of the Student Group Editor. To learn more about the Student Group Editor and how to access it, please click here. This page was last modified on 4 April 2018, at 15:12.